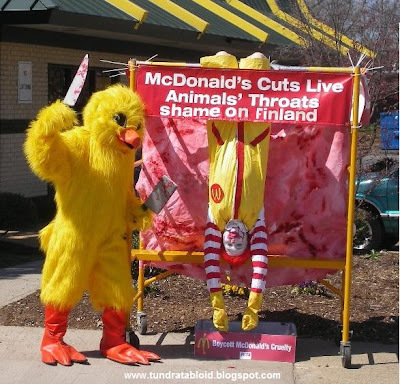 McDonald’s in Finland Sells Halal Slaughtered Chicken Products……. – The Tundra Tabloids……. Though the Christian faith allows the eating of meat sacrificed to foreign gods, no one is forcing Christians to eat meat sacrificed to the moon god allah. What the Tundra Tabloids finds interesting, is the fact that McDonald’s Finland, hid the fact that its chicken meat served to its Finnish customers, has been slaughtered according to the Islamic ritual slaughter system (Ḏabīḥah) to render the meat Halal, or fit, for Muslim consumption. Nordic McDonalds are using a Danish Lantmän’s Danpo produced chicken. Danpo slaughters chickens according to the correct Islamic manner, as the company’s products are exported to many Arab and Muslim countries. In traditional halal slaughtering, the animal’s head turned by a Mekkaa and carotid artery is cut from the animal which is conscious. At the same time, pronouncing a prayer. In EU countries, the animals are stunned before slaughter. In an interview published in Kotimaa, Finnish McDonald Quality Manager Tiina Partanen says that the method used by the restaurant chain’s subcontractors is not a traditional halal slaughter, because the animals are stunned before. The slaughter is overseed by a Muslim employee who submits aprayer “Allah, Allah is the greatest” at the beginning of the slaughter, and every time when the process is interrupted. Partanen is not taking a position on whether Finnish customers have a right to know they’re eating chicken, which at the time of slaughter have an Islamic prayer uttered over them. NOTE: There has been a lot of blow back from Finnish Christians to the original article (not online), and many are calling for a boycott of McDonald’s due to being fooled and having meat served them sacrificed to a foreign god. Previous Post Previous Post ESW Report: Multiculturalism in Vienna……. Next Post Next Post Obama Forced to Re-emphasize Support of Israel…….